Do the royal family, Downton Abbey, and the beloved Harry Potter have you longing for a London family vacation? If the answer is yes, prepare yourself for sticker shock. Even for those accustomed to the high cost of living in US cities, the price of hotel stays and dining in London will be a bit of a surprise. London is an expensive city. However, with a few tips, you can visit London on a budget with your family without breaking the piggy bank. Looking for tips on budget travel to London? 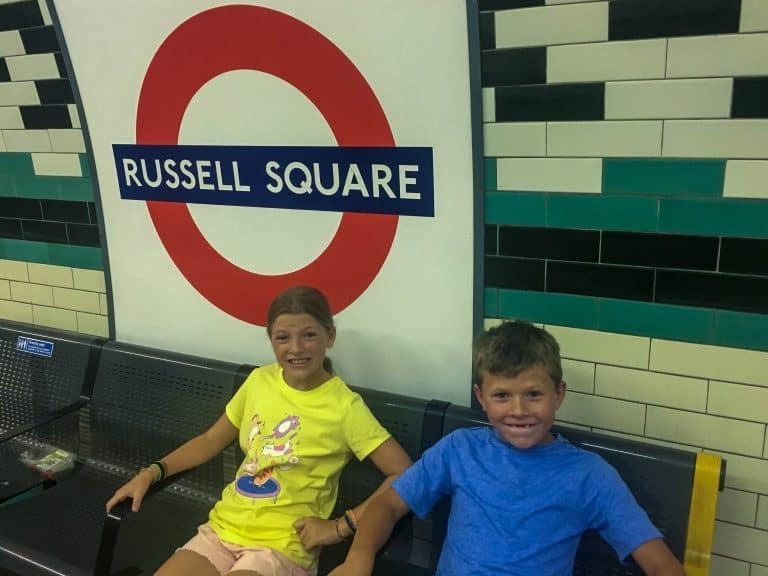 We have tips on everything from where to stay on a trip to London with kids to how to get around the city using public transportation. London is well-known for its excellent under and above-ground public transportation.Traffic is a snarl and cabs are expensive. The Tube, London’s subway, is the way to travel. Children under 11 travel free in The Tube with a parent. Kids ages 11-15 can receive discounted rates. London transportation can be cheap for families looking to travel to London on a budget, especially with young children under 11. If you are traveling with very young children and use a stroller, do be aware that many London Underground stations have lots of stairs. If stairs are a problem, look for accessible stations using a map of the London Underground. We recommend that you take your time to figure out which London transportation card is best for you. Are you traveling to London for 5-10 days? A 7-Day Travel Card for Zones 1 and 2 loaded onto an Oyster Card is likely your best bet. Oyster Cards can be purchased at most train stations. Each person ages 11 and up need their own card. A 7-Day Travel Card can be loaded directly onto an Oyster Card when it is purchased. If you extend your visit past 7 days, you will pay as you go. Fortunately, there is a daily cap on the charges for a single day on the London Underground. The cap for Zones 1 and 2 is roughly the equivalent of 10 US dollars. It doesn’t matter how much you travel in Zones 1 and 2, you will not be charge more than the cap on a given day. If you’re looking to save money getting to London from Heathrow Airport, remember to book your tickets on the Heathrow Express well in advance. Alternatively, it is possible to reach central London using your Oyster Card on the London Underground; it just takes about twice as long. 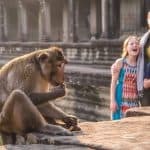 Family Friendly Hotels nearby, book your stay! You could spend your entire vacation at London’s free, world-class museums. Choose a few or several galleries in each museum. The Natural History Museum always gets a thumbs up from young kids. Another highlight is the Imperial War Museum, great for older kids, with a focus on WW1, WW2, the Holocaust, and the United Nations. The Museum of London, the world’s largest urban museum is usually a good bet, too. The Tate Modern is another museum that is free to visit for families. Many of London’s free museums offer family programs. Check the schedule at The National Gallery, London, in Trafalgar Square. If you’re visiting London’s top sites like Buckingham Palace and Westminster Abbey, you’ll likely be passing through this busy area on multiple occasions. The National Gallery is free, so take a walk around. The British Museum is also free to visit. Many families stop in just to see the highlights, like the Rosetta Stone. However, if you have more time, be sure to stop by the Families Desk in the Great Court and pick up a free family trail. 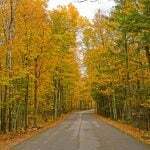 There are several trails from which to choose, including Ancient Greece and Ancient Britain. Our family choose to learn a bit of British history. Family trails take 30-45 minutes to complete. Surprisingly, we found the most family fun at the Victoria and Albert Museum. 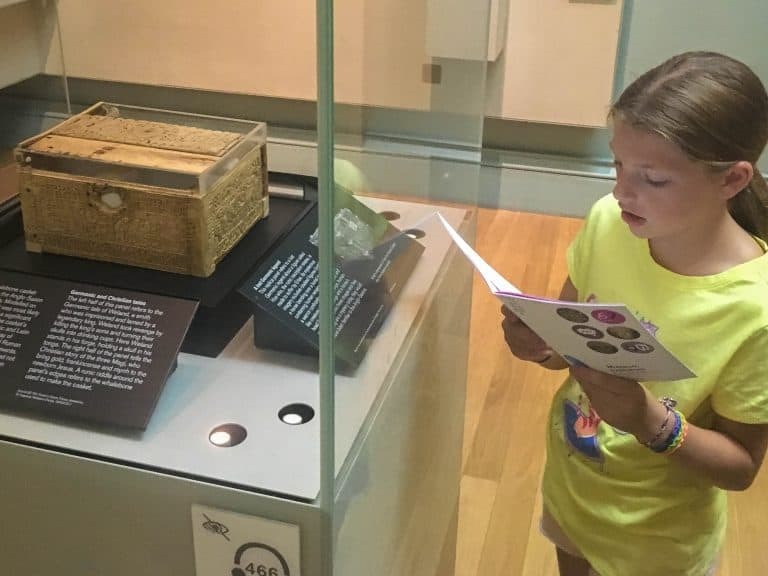 From hands-on displays to the addictive V&A Secret Seekers App, the Victoria and Albert Museum was our family’s favorite free London museum. The app directed our family all around the museum to the most historic rooms and displays. After answering questions on the app for hours, we enjoyed a snack in the most ornate museum dining room that I’ve ever seen. What a great way to spend an afternoon inside during a London heat wave! 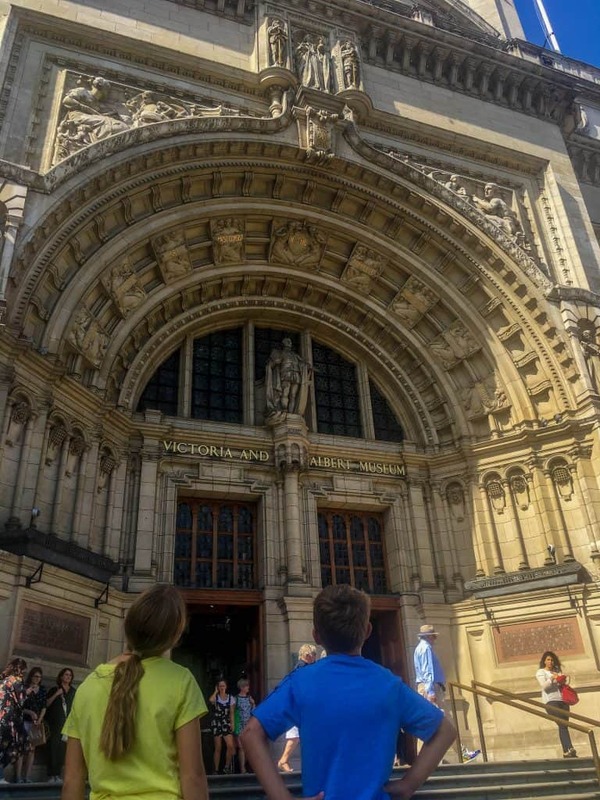 London Budget Travel Tip: Looking for things to do on a London family vacation? We share our top 20 Free Things to do in London with Kids– check them out! Locals and visitors love London’s parks. Access is free, making them perfect for families traveling to London on a budget. Parks are usually fenced to deter escaping little ones. 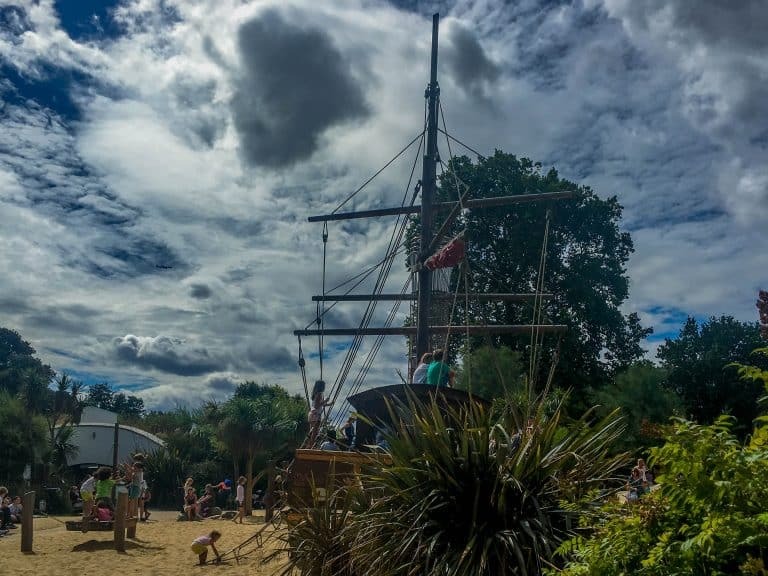 The most famous may be the Diana, Princess of Wales’ Memorial Playground with a pirate ship. During a summer heat wave, you’ll be happy to know that the Diana, Princess of Wales Memorial Fountain, also located in Hyde Park, is a great place for kids to play for free. Yes, it gets busy, but little ones could spend hours wading through the streams of water. 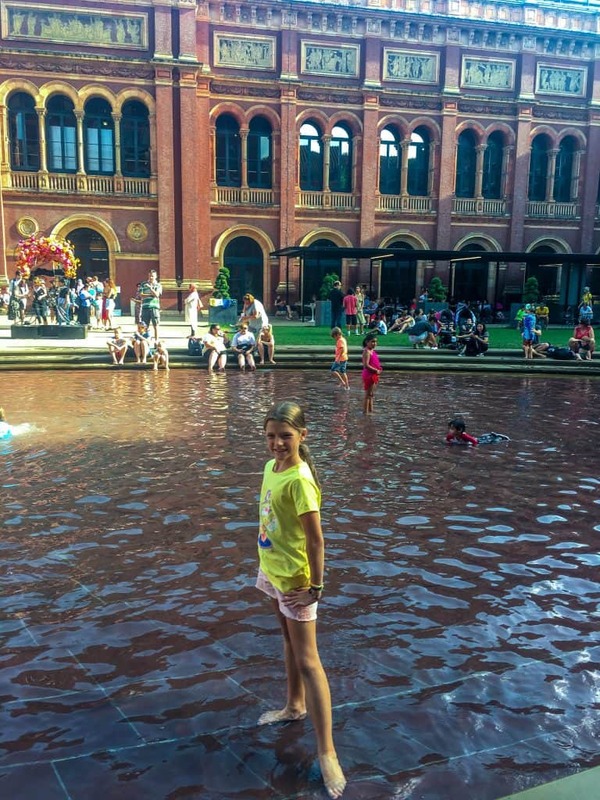 Another free place to cool off in London is the splash pool and fountain in the courtyard of the Victoria and Albert Museum. If you want a guided tour without the high cost of a private guide, try London Walks. They offer two-hour guided walks around the city for $20 per adult and kids under 15 are free. On the Harry Potter walks, kids are $6 and under 8 is free. They have a list of recommended London walks with kids and you can decide at the last minute, there are no reservations. And if you’re visiting during the holidays, check our guide on Christmas in London. Americans are fascinated with England’s royalty and don’t underestimate the popularity of seeing royal pageantry for kids. The changing of the guard at Buckingham Palace is an event. Unless you prepare for it, you’ll find yourself staring at the backsides of the horses and guards. Not fun. 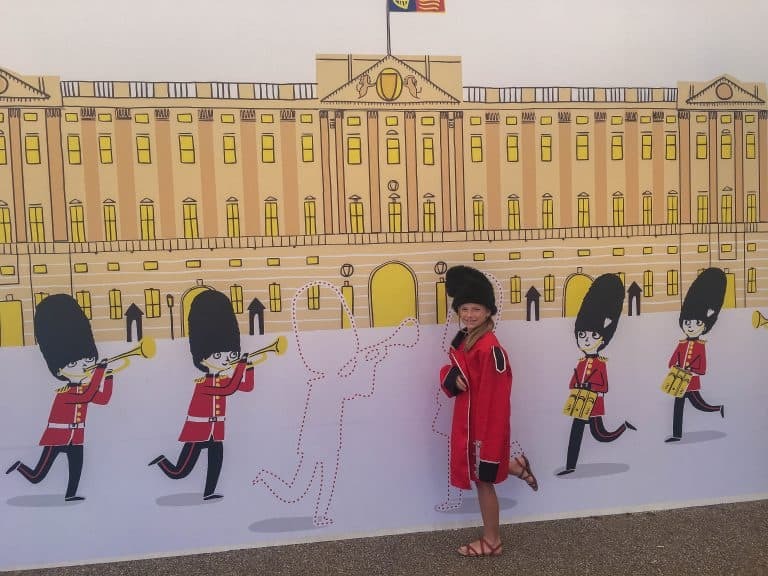 The changing of the royal horse guards at Whitehall allows kids to get up close and personal with guards and horses without the huge crowds. It finishes just as the Buckingham Palace changing of the guard parade begins and if you run you can catch some of this “show” as well. If you’re visiting London during the summer months, check to see if Buckingham Palace is open for tours. While this isn’t one of the cheapest things to do in London, it is a worthwhile splurge for families. An audio tour for kids in included in the price of admission. Also, there are fun activities for families located outside the palace for families to enjoy after their self-guided audio tour. Traveling to London on a Budget? Family Friendly Hotels nearby, book your stay! 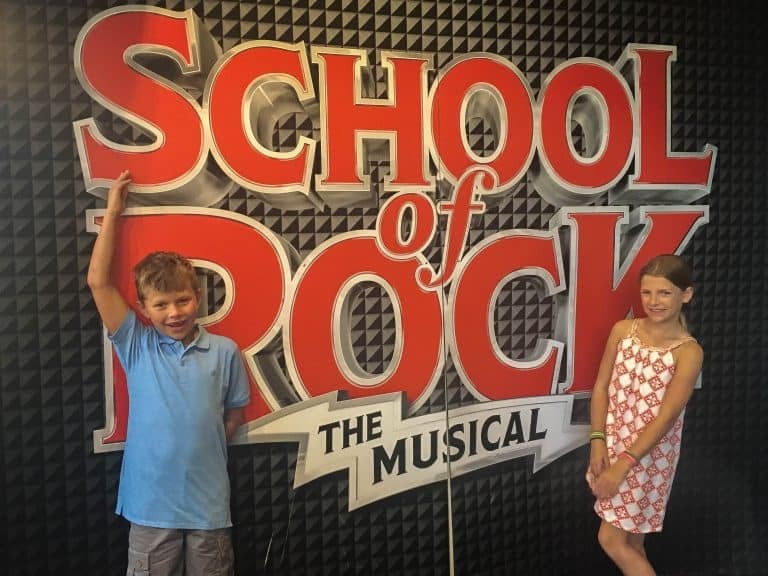 If theater is something that your family enjoys, London is a great place for families to enjoy a show. From Wicked to the Lion King, there are lots of shows for families to choose from in London’s West End. There are discounted tickets available year-round. However, some of the best discounts can be found in August during the special Kids Week promotion. London Kids Week actually lasts the entire month of August. Beginning in June, families can purchase special free tickets for kids. 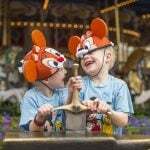 For every adult ticket, one free children’s ticket can be purchased for certain shows. Additional children’s tickets are half price. My family saw Aladdin, The King and I, 42ndStreet, Wicked, and Mama Mia using this promotion in 2018. We only live four hours from New York City, but we found it cheaper to see these shows in London. While you may not think of having afternoon tea in London as a budget-friendly experience, it can be a relatively good deal, especially for families. Food is plentiful at afternoon tea, you’ll leave stuffed, having eaten enough for both lunch and dinner. Desserts that go untouched at afternoon tea can often be packed away for a snack later in the day. If you’re enjoying tea with young children, be sure to find a place that has offer’s a children’s tea. Children’s tea is often half the price of an adult tea. It also offers a selection of sandwiches that are more familiar for children than the adult selections. 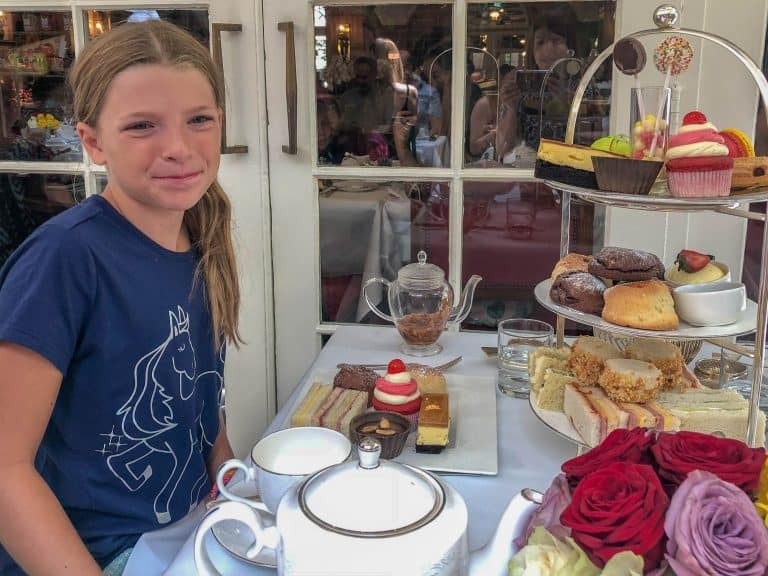 Furthermore, if a restaurant offers a children’s tea on their menu, families can know that well behaved children are welcome for afternoon tea. 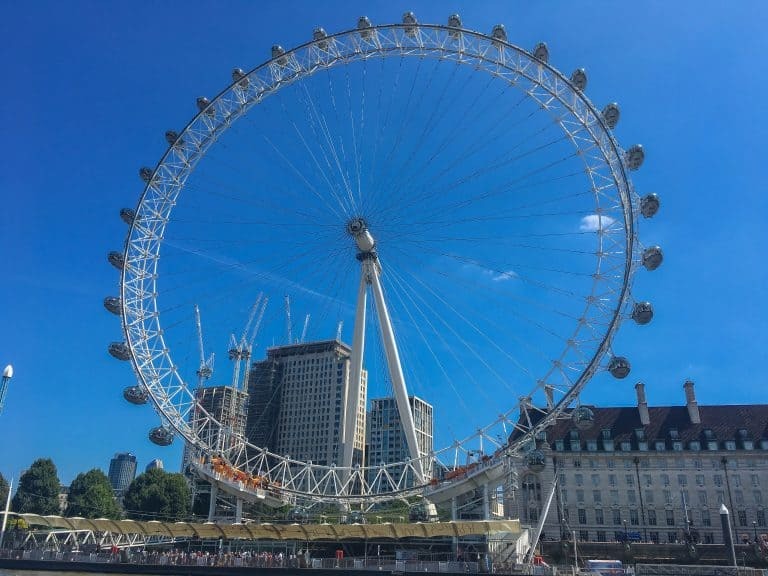 If you’re going to travel all the way to London, be sure to make room in your budget for those things that your family loves to do when they travel. My kids love to take bike tours. They typically meet other kids. Also, they burn off some energy while seeing a large part of the city. I have found that bike tour guides tend to be active people that enjoy having kids along for the ride. I enjoy bike tours because we learn a lot about the city and get good ideas for things that we want to return to explore further. Whatever it is that your family loves, be sure that you budget for it and include it in your itinerary. 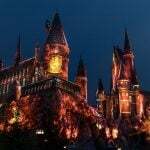 If you have a Harry Potter fan, it’s not worth flying all the way across the Atlantic only to skip the Harry Potter Studio Tour. Have a teenager studying World War II? Don’t skip the Churchill War Rooms. 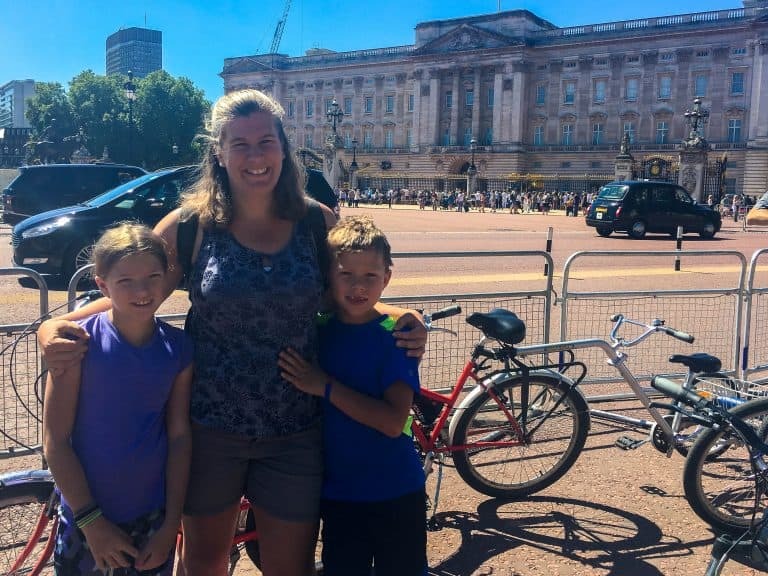 Be sure to prioritize what is most important to your family on your London family vacation. 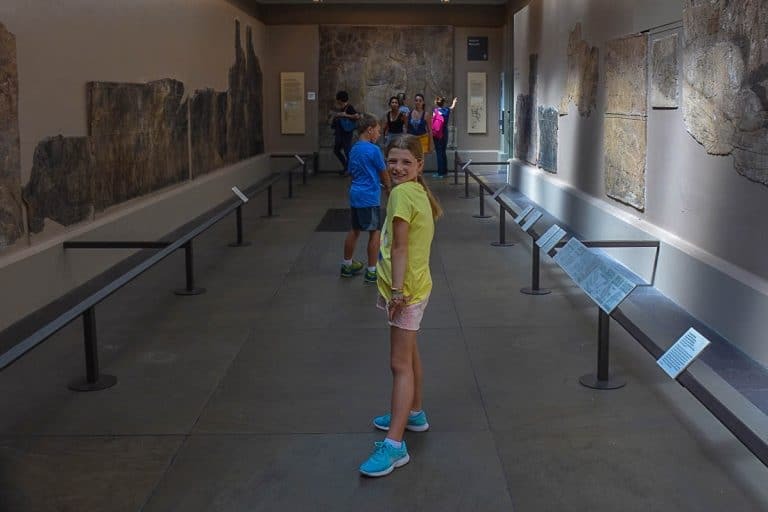 Unless your family is planning to go to several museums with an entrance fee, it is unlikely that a London Pass will be economical for your family, especially when traveling with younger children. When families first begin to research hotels in London, they might begin to panic. Why? Because many hotels in London, and Europe in general, do not accommodate more than two people in a room. Room rates for a family of four easily top $500 a night in the mid-range (not upscale or luxury) hotels. London Budget Travel Tip: Consider booking a family room at one of the 31 best hostels in London. A good option for families is the budget hotel Premier Inn County Hall. Premier Inn has a chain of over 650 hotels across the UK and Ireland. 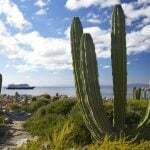 They are known for having flash sales and deals where rooms are $50 or $60 a night. However, these deals are rare at their London properties. Premier Inn is a safe bet with kids. You know what to expect -clean, modern, functional, spacious rooms that sleep four people. Family rooms have a double bed, a single sofa chair that pulls out and is very comfortable, and a cot that’s better for a younger child. The trade-off is that the room could be in any city. There is nothing that screams London. The location of the Premier Inn County Hall on the Thames River is spectacularly convenient for tourists. The London Eye is next door along with a playground and park, and there are two tube stations within a five-minute walk. Within a 20-minute walk you’ll find Westminster Abbey, St. Paul’s Cathedral, Buckingham Palace, Covent Garden, and The Churchill War Rooms. Big Ben is just across the river over Westminster Bridge and you can catch a ride to the Tower of London at the dock in front of the hotel. Editorial Note: Many thanks to Kristi Marcelle who wrote the first version of this article. Kristi received two nights complimentary at Premier Inn in order to review the property. She liked it so much, she stayed another two nights on her own. Considering a stop in Ireland? Check out this Ireland with kids travel guide.